Our lives are filled with treasured memories captured in family photographs or repeated in song lyrics, poetry or cherished phrases. Why not have these memories displayed in as beautiful Custom Word Canvas Prints your design to fit your unique sense of style and home décor. We have a massive selection of Word Canvases to choose from. 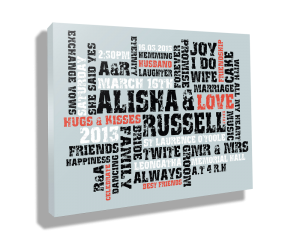 Whether you’re designing word art for someone special in your life or if you’re creating a piece for yourself, our custom canvas prints are sure to please everyone and be the centre of attention and a great talking point in any room. We have a custom canvas prints with words for every taste and every occasion and specialise in printing words on canvas in totally unique ways. Our custom word art canvas prints can be personalised using one of our 40 distinct and creative typographical styles in a wide variety of fonts and colour schemes. You’re sure to find something perfect for whatever occasion from a wedding gift to a birthday present idea or for whichever person you’re shopping for, at Beyond a Word we have the largest selection of Words on Canvas Wall Art in Australia. Designing your perfect custom canvas prints is simple and convenient, ordering is easy, and our sizing and framing options make our prints affordable. 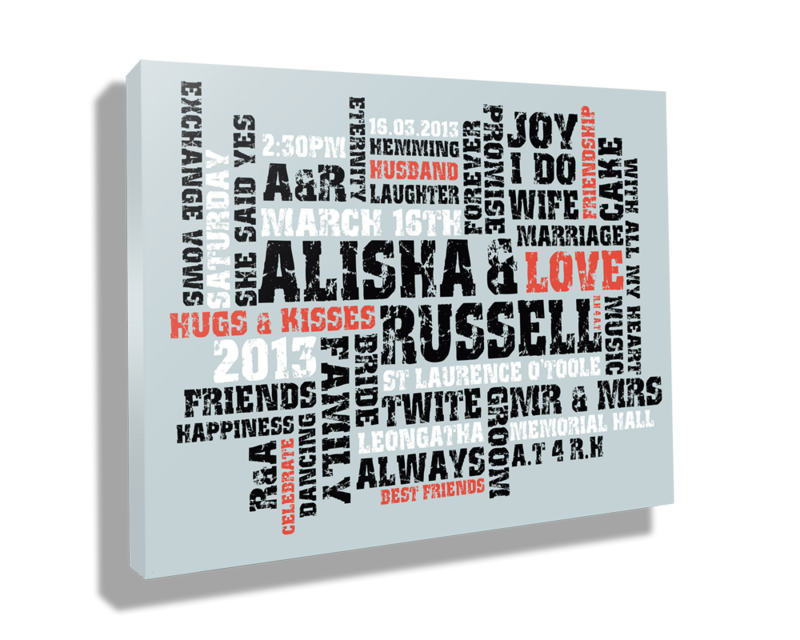 Visit our gallery today and get started creating your perfect Custom Word Art Print. To view the 100 or more, unique customised word art & personalized canvas with words options simply navigate to this page. We’re sure they’ll be something you’ll love. As always feel free to contact us if you have any questions about our custom canvas prints with words, we’re always happy to help in any way we can. A Custom Canvas Print makes the perfect, unique Personalised Gift.